The only grain permitted to be used in the world’s most historic and prestigious style of whiskey, single malt, is malted barley. 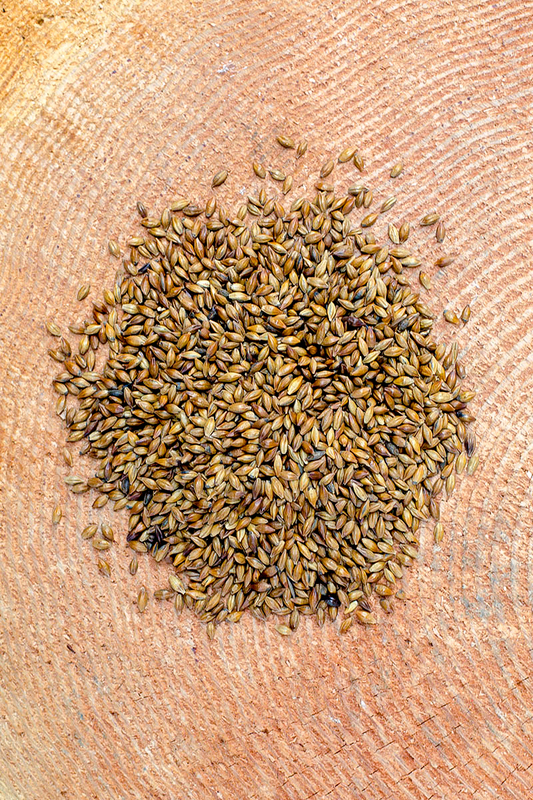 Commonly referred to simply as “malt,” this germinated grain has been used in alcoholic beverages for millennia. You would be forgiven then, for thinking that this grain is revered in our industry. You might think that—like the world of wine where they also only rely on one fundamental raw ingredient, grapes—our industry celebrates the differences between various types of barley and that distinct styles revolve around it. Unfortunately, that assumption couldn’t be more wrong. It’s no great secret that we’re relatively new to the world of whiskey. We were founded in 2010, carrying with us ambition and a confidence in our own wherewithal. But we haven’t been mashing, distilling, and vatting for decades. We don’t come from a long lineage of whiskey makers who have passed the business on from generation to generation, each time with the same notions and formulas for how whiskey should be made. Ours is a very American story—one that places the freedom to pursue new possibilities on the highest order. Breaking into this industry, we were surprised to find that there was little regard for our primary raw ingredient. Not only is highlighting varietal difference not practiced, but the idea is actively denigrated. “Barley has no flavor.” “Barley doesn’t matter.” “Varietal flavor doesn’t exist.” These are real quotes that we’ve seen multiple times over since our founding. Compared to the wine business, most of the Scottish whisky industry couldn’t be farther behind in their thinking. Make no mistake, we reject those assertions outright and are actively proving them wrong in trials with dozens of new barley varietals never before used in whiskey-making. But there’s another aspect of malted barley that is also not widely considered today—the “malted” part of it. Barley must be malted in order to develop enzymes in the grain that will convert the starch into sugar during the mashing process at a distillery or brewery. This process has profound implications on the eventual flavor profile of the malt as well as any products made from it. 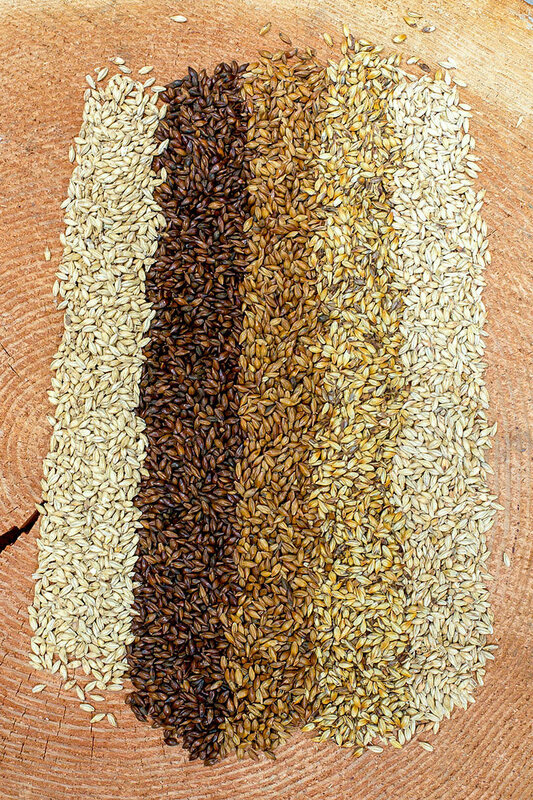 During the drying process in malting, a broad variety of flavors can be produced based on the technique and duration of heating the germinated barley grain. Certainly, it is a longstanding conviction in the brewing industry that these roasting levels contribute a great deal to the final character and flavor profile of a beer. For hundreds of years (not just in the recent craft brewing renaissance) unique styles of beer have developed based on the diversity of malt available to their breweries. From the lightest pilsners, through ambers, browns, porters, and finally to stouts, the spectrum of malt flavor is showcased and understood at a fundamental level. However, the whisky business has dismissed this concept almost out of hand. While there have been a few (to our best understanding, three) examples of roasted malts being used in this business, there is little acceptance of the flavor contribution of malt and less motivation to push the frontier of whiskey beyond where it has languished for generations. After all, not only do roasted malts yield less but they also cost more. Sadly, if there’s anything that the current whisky industry has demonstrated, it’s that low cost and high yield are the primary requirements for grain. Why don’t we find the most flavorful raw ingredients to use first, then seek to coax from them the best yields we can? At Westland, we’ve taken a fundamentally different approach. Why don’t we find the most flavorful raw ingredients to use first, then seek to coax from them the best yields we can? There is nothing inherently wrong with high yields or low cost, but when they come at the expense of flavor, then we must begin to consider that the priorities in this business are out of order. For us, our first priority is to champion the flavors of the raw ingredients. This represents a remarkable shift away from how most single malt whisky distilleries operate. To do this, we use a mash bill (an American whiskey-making term for a recipe of grains) of five different types of malted barley. 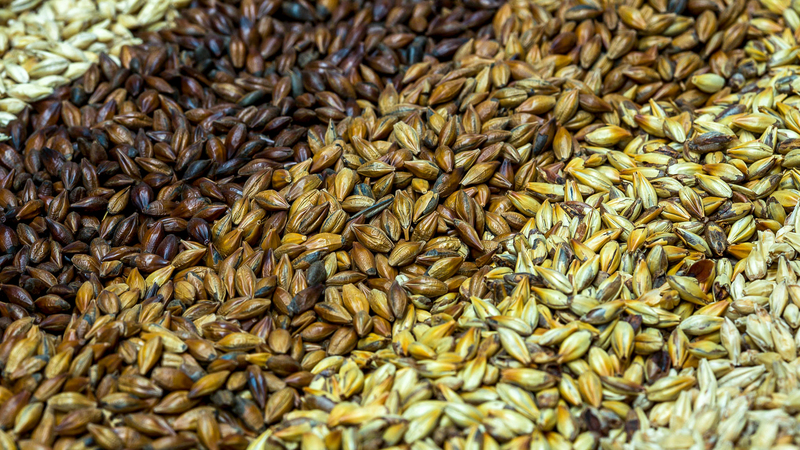 5-malt, as we call it, starts with a base of pale malt grown and malted in Washington State. The name “pale malt” refers to a standard, low-temperature drying process in malting. For reference, the pale malt we use is similar to what is used in Scotland when they are not making peated spirit. 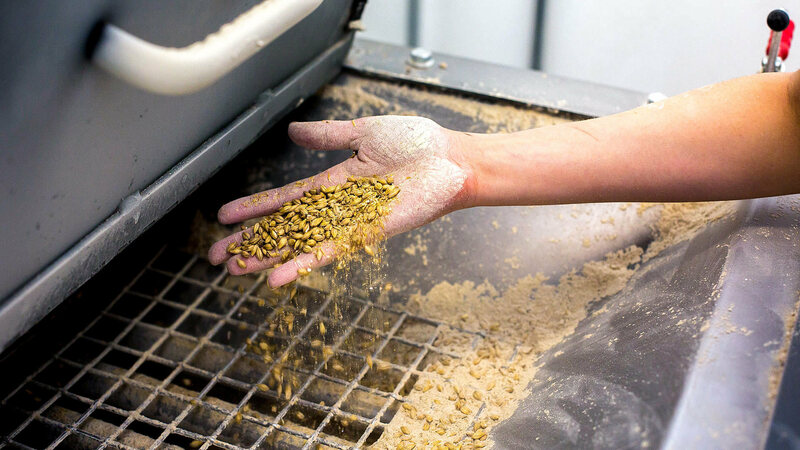 With the foundation of the grain bill set, we begin to add high-kilned and roasted malts. While we sometimes refer to them all as roasted malts for ease of conversation with those new to this topic, there is technically a difference: high-kilned malts are made by simply raising the drying temperatures in a normal malting cycle, whereas roasted malts undergo higher temperature exposure in specially designed equipment similar to a coffee roaster. But in the end, the effects are similar—by applying heat to germinated barley, flavor compounds are being produced via the Maillard reaction pathway. When amino acids are combined with sugars and the application of heat, flavor compounds will be produced. It’s similar to, and commonly mistaken for, caramelization (the combination of a sugar with another sugar under heat), and you likely see this reaction every day. The browning of bread in your toaster, the blackening char when you sear a steak, the goldening of your cake in the oven; all of these are examples of flavors being produced by the Maillard reaction. Made in malting houses across the world (and for us in Washington State) not just Germany, this is a style of malting that originates from its namesake city and is used in the malty lagers of that region. Here we see flavors of Grape-Nuts cereal and scones compared to the biscuit and almond of the Pale Malt. This is a completely unique style of malt made by only one producer in the world, Briess Malting Company in Wisconsin. The name tells much of the story. It’s special. Extra special. Made with a secret process that even we aren’t privy to, ESM brings unique flavors to the mash bill such as toasted marshmallow, waffle cone, cedar, and Snickerdoodle cookie. A roasted malt not commonly made in the United States, brown malt brings hazelnut and pecan notes to the table. This is another roasted malt that is made at only one location, Thomas Fawcett and Sons in the UK. Its name references its position relative to normal “chocolate malt” that is produced by most maltsters, actually tastes more like coffee compared to the Thomas Fawcett’s genuine chocolate flavor. We also believe we get additional background notes of leather and tobacco to accompany those primary chocolate notes. With this recipe we showcase the wide spectrum of flavors that malted barley can bring to whiskey. And there are hundreds of other different types of malts out there, used eagerly by brewers yet for some reason shunned by distillers. There is nothing more satisfying than seeing someone tasting our whiskies for the first time and hearing “ice cream cone!” or “I taste chocolate!” Whiskies can have beautiful flavor from the grain if you choose to accentuate them. If your main priorities are realizing the lowest cost and highlighting just the oak influence, you’re discounting the most fundamental of raw ingredients. But almost every time you pour yourself a whisky from Scotland it is likely coming from a distillery that at best doesn’t care about grain flavor and at worst doesn’t believe that it even exists. What is remarkable about the current state of the whisky industry is that they seem to trade on ideas that in other walks of life we would find unacceptable. Does Cabernet Sauvignon taste different than Merlot? Of course it does. Do you care about getting the temperature and time in the oven just right for your golden-brown croissant? Absolutely, you wouldn’t think twice. But almost every time you pour yourself a whisky from Scotland it is likely coming from a distillery that at best doesn’t care about grain flavor and at worst doesn’t believe that it even exists. Malted barley is foundational to this business and yet the mainstream whisky industry has said that it doesn’t matter. This is why we not only use kilned and roasted malts in all three whiskies of our core range, but use them at the highest level in our flagship product, Westland American Oak. We often tell people that our flagship whiskey is also our most progressive whiskey, but why? We believe that American Oak needs to best represent the manifestation of our beliefs and demonstrate that raw ingredients do matter to us. We’ve used our 5-malt recipe without fear of doing something different or that it’s more expensive because we believe in making the best whiskey possible. At Westland, we see potential in the world of single malt whiskey and our ethos of stepping into the unknown compels us to explore further. You don’t just experience this in our work on developing the whiskies of the future. Every time you have a dram of our Core Range expressions you can taste the results of that ethos today.